Because I am going to be an awesome Mom, I will totally keep my ears open to the best possible options for my kids, because I’ve totally set my sights on that, focusing on family instead of career and all. Obviously. Until hell freezes over then, I will be buying my more reproduction-friendly friends subscriptions to Wittlebee (rhymes with “little bee”), a Science-backed “get random stuff sent to you” startup run by my old friend and former Myspace marketing exec Sean Percival. 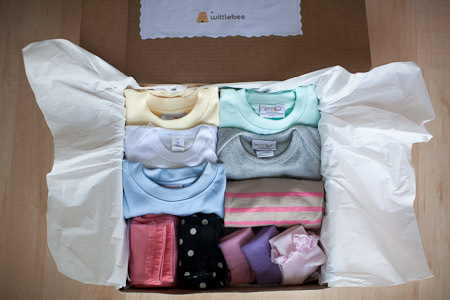 Wittlebee is like a Birchbox for kids clothes, where parents can get recurring/one-time shipments of children’s clothing for $39.99 a month — 8 items in total from brands like American Apparel and Cottonseed. And yes, you can pick gender, age style and color preferences in the on-boarding process. Percival tells me that the appeal of Wittlebee — in the same space as Thredup— is essentially the money saved by new parents, as the startup essentially packs about $80 of clothing in to each $40 box of clothing sent. Knowing he wanted to do his own thing post Myspace, Percival tried out a few startup concepts before he settled on the Wittlebee model, operating the business out of an old server room at the Science offices until it grew enough to warrant a bigger office space. Percival was sure he wanted to do a subscription e-commerce play — and his decision payed off — at about 100 subscribers Wittlebee moved out of the server room and the company is now at about 500 ($20K in revenue) in a month’s time.